BLAEU - Palatinatus posnaniensis in Maiori Polonia Primarii nova delineatio. BLAEU, J. - Palatinatus posnaniensis in Maiori Polonia Primarii nova delineatio. Palatinatus posnaniensis in Maiori Polonia Primarii nova delineatio. - BLAEU, J. Title : Palatinatus posnaniensis in Maiori Polonia Primarii nova delineatio.. Size : 16.3 x 20.5 inches. / 41.3 x 52.0 cm. 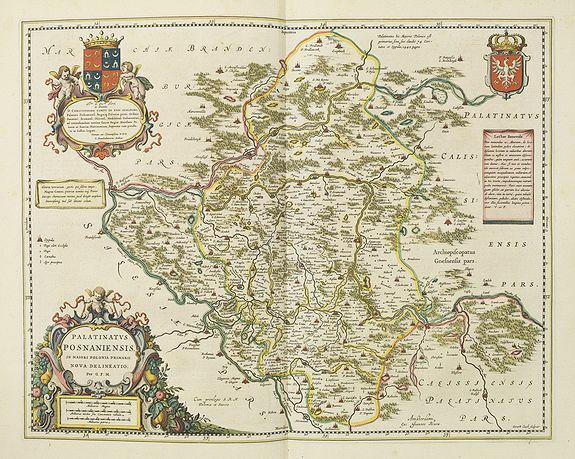 Description :Rare map published by Joan Blaeu in his Major Atlas. With decorative cartouches, The cartouche upper left with a dedication to Georg Freudenhammer, who was a doctor and most likely treated once the mapmaker of this map: Wojewoden Krzysztof Opalinski (1609-1655), as a result he dedicated this map to him. Engraved by Gerard Coeck (1608-1649). According to Niewodniczanskiego on Imago Poloniae, K82, a first state should exist with a date of 1645. However no copies are known to exist. The atlas was included in Blaeu's Atlas Major. The coat-of arms heightened in gold. The atlas Major was printed only in small numbers, the Spanish text edition is extremely rare. The Spanish edition was never completed. When fire destroyed the Blaeu printing house at the Gravenstraat in Amsterdam in 1672, the final volume was in the press and consequently lost. Niewodniczanskiego on Imago Poloniae, K82. Condition : Very good condition. Printed on very thick paper. Very good and dark impression. Coat of arms heightened with gold. Spanish text on verso.